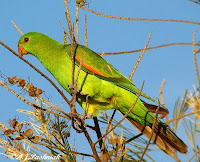 This beautiful Red-winged Parrot (a female or a juvenile - not sure which) came into my yard yesterday afternoon. It really made my day because I have only seen one other like this and that was about a year ago and only brief glimpses then. I don't know how common they are here but for me it was great to get good views and to take a number of photos. 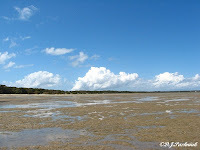 Inskip Point was beautiful today - as it usually is! I was out there at low tide so the bay which is south of the Point was mostly sand flats rather than water. The extensive sand flats are ideal for shorebirds hunting food at low tide. Terns roost out on the sand flats as far from disturbance as possible. I saw a small flock of Crested Terns there today. Most still look rather 'scruffy' in their non-breeding plumage. It will be a few weeks yet before they display their full breeding plumage. 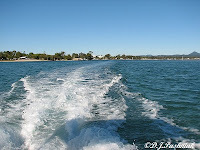 There is a very narrow neck of land between the top of the bay and the open ocean. 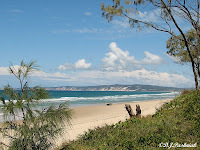 From the open ocean side there is a great view south towards Rainbow Beach. The name - Rainbow Beach - was given because of the colored sand in the cliffs south of town which stretch left in the photo. Yesterday I went out to do the monthly count of the site at Crab Creek for the Queensland Wader Study Group. I was expecting the same small winter count that I have had now for several months – a few Red-capped Plovers and Pied Oystercatchers and not much more. BUT instead the migratory waders are back! I guess I should say that very small numbers of waders were there but it's a promise that the big flocks of summer migrants are on their way. Winter is almost over! Yesterday the first indication I had that there were waders was the sound of Eastern Curlew. 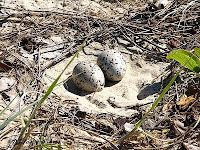 They were well hidden on a sandbank among some small mangroves. I did not want to disturb them so did not go too close but unfortunately one sighted me and then they were all off. There was a small group of Bar-tailed Godwit which were sleeping and didn't disturb. Pacific Golden Plover looked at me but stayed where they were. 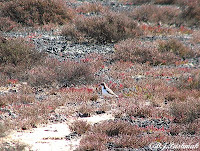 One still had splotchy black patches – the remnants of breeding plumage. Whimbrel were further back and too far for good photos. I also saw Red-capped Plover, Pied Oystercatchers, Masked Lapwing, White Ibis, Little Pied Cormorant, and a Little Egret. 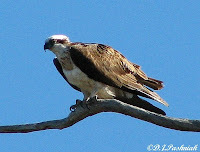 To make a great finish to the day this Osprey was sitting on a dead branch next to a nest. 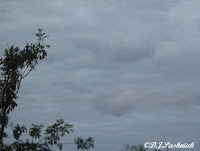 I could not see anything in the nest but I do not think that the gentle noises the bird was making were for my benefit! This was the sky that confronted me as I stepped outside early this morning. Talk about “the best laid plans”.... I had planned to kayak to a favorite shorebird roost but I just do not enjoy this kind of weather while out on the water. So instead I decided to organize my photos from the last few days and post a few of the Cooloola Airport. What a grand title for a very simple affair! I am sure there are other places like this in small towns all around Australia – but it still feels a bit incongruous when confronted with the reality after following the very proper looking signs! This is the airport hanger. Sometimes there are as many as three small planes parked there waiting for their owners. 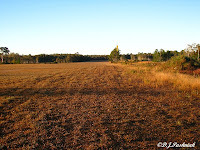 This is the airport runway - a grass runway in an open space in the bush Right now the tracks leading to and from the runway are edged with flowers. Several varieties of yellow pea flowers (which I won't even attempt to ID) edge the track and sweet smelling Leucopogon is set back under the taller trees. Yellow wattle (Acacia hubbardiana I think) overhangs the track. The airport is certainly not the biggest or best that one could see, but the landscaping - which owes nothing at all to those who planned and developed the airport - is definitely fantastic! 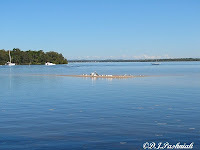 A couple of days ago I was down at the Noosa river again to do another survey of the birds on the sandbanks. (See previous posts June 8 and July 19). Once again it was a perfect day and enjoyable just to be out on the river. There were the usual large numbers of Crested Terns on the sandbanks, and coming and going from the open ocean. We did not see the Beach Stone-curlews this time. However, it was not a very high tide and there were lots of sand banks exposed even on the high tide so they could have been anywhere. 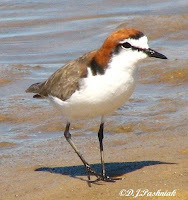 There were still lots of Double-banded Plovers – most in close to full breeding plumage. I got good views of Bar-tailed Godwits with some interesting feather moult occurring. 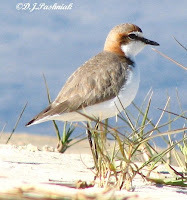 There were lots of Red-capped Plovers and I got good close views of a male and a female. The highlight of the day was finding a Pied Oystercatcher nesting. I had been walking along the edge of the sandbank that council closed from October to March when a Pied Oystercatcher flew up from the grass just in front of me. I stopped and looked at the area it had come from and there was the nest just in front of me. I did not go closer but took several photos at full zoom on the camera. Then I backed off a good way and watched. Pretty soon the adult came back but watched me very suspiciously as it walked slowly back to where the nest was. We have asked the Ranger, who also helps with the survey, to keep a watch out for the birds. There are so many raptors patrolling the river that there is no guarantee that the eggs will even hatch – let alone that the adults will successfully raise young – but we hope so! Yesterday, this Little Friarbird was enjoying the grevillia flowers on a small tree in my neighbor's yard. I usually see Noisy Friarbirds rather than Little Friarbirds so was pleased that this one sat still for long enough to get some interesting photos. After we finished looking at each other - and I finished taking photos - it went back to the flowers. 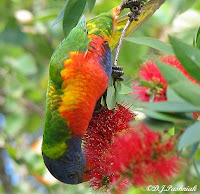 Rainbow Lorikeets are very common in this area and in my backyard. 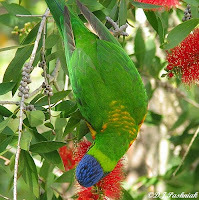 I planted grevillias hoping to encourage the birds into my yard and the lorikeets are usually there. 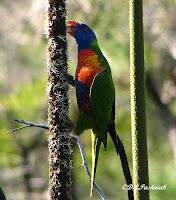 They are noisy and colourful birds and I enjoy watching them interacting with each other. Early in the morning large flocks fly overhead with their noisy cries. Late in the evening I can hear their sleepy murmurs as they settle down to roost in the pine trees next door. I enjoy following them around with the camera but they seldom sit in a good pose for pictures. 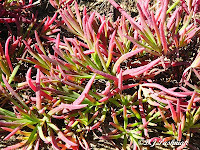 More often they are hanging upside down or walking around and under the foliage. Pictures can evoke powerful memories for many people. For me it is sounds that remind me of the most vivid memories. When we were children, year-end holidays were always spent camping in a tent at the beach as far away from 'civilization' as we could get. 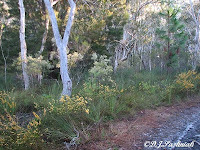 My father always found a spot tucked just behind the sand dunes and in among the casuarinas and banksias. The beach, of course, was filled with the sound of the sea and the cries of gulls. But the tent itself always seemed to be surrounded by the sounds of Leatherheads – Noisy Friarbirds as I now call them. We would wake to their chatter in the early morning and run down to the surf for a swim before breakfast. In the evening as we sat around the campfire we listened to them in the trees as they settled down for the night. In between were long lovely days of sun, sand, and sea – and nothing and no-one in sight except ourselves. 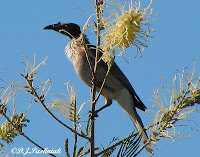 I have planted grevillias in my garden and the Noisy Friarbirds are frequent visitors. They still sound like summer to me and I know I can still find the ocean waiting for me when I get in the kayak and get out there. With a mid-morning tide and the weather bureau promising another dry and sunny day I decided to kayak around to the shorebird roost at Smooger Point yesterday morning. The water was cold! - but apart from that it was beautiful. My friend Sarah came with me because two pairs of eyes are always better when counting shorebirds. The roost at Smooger Point is not counted regularly and I really wanted to know how many waders and how many different species were using this roost during the winter when most birds have gone to the northern hemisphere to breed. 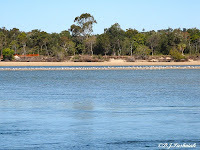 We put our kayaks in at the Carlo Creek boat ramp and paddled back towards Tin Can Bay. The tide pull inside the bay area is not strong but it makes the paddling a bit easier to go with the tide each way. Most of the birds were using the exposed beach at the edge of the water. On very high tides they retreat up into quite extensive areas of salt marsh vegetation behind this. 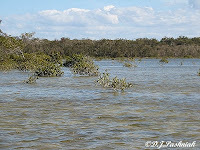 There are small mangroves fringing this saltmarsh on the water side which makes it very hard to do a count when the tide is high. Yesterday's tide should have been perfect - but as we paddled within sight of the roosting birds we saw a dingo skulking along behind the roosting birds. The dingo was black so possibly one of the ones that have cross-bred with dogs in this area. The birds, of course, were disturbed. The dingo took off but it took a while for the birds to settle again. As well as this there were a pair of Whistling Kites patrolling the area and later also a Brahminy Kite. Often it is possible to get quite close to roosting birds without disturbing them but not after all this. We used a spotting scope and hoped that they would stay settled for long enough to get a good count. We counted 535 birds and saw local birds - Red-capped Plovers, Pied Oystercatchers, a Little Egret, and a White-faced Heron; - as well as overwintering migrants - Red-necked Stints, Great Knots, Greenshanks, Grey-tailed Tattler, Whimbrels, Bar-tailed Godwits, and Eastern Curlew. The highest counts were the Bar-tailed Godwit – 188, and the Grey-tailed Tattler – 185. The Great Knots were in constant motion feeding along the edge of the water. All the other birds were resting. I have seen birds feeding constantly like this right after they come down from a migration flight but I would think it was too early for this species to be returning. I enjoy monitoring the birds like this because I usually end up with more questions for which to try and find answers. Some of the roosting shorebirds at Smooger Point yesterday. This week I have been out walking through my favorite patch of wallum again. However, it has taken me three days to actually be able to post about what I found. First I had trouble getting good photos – my usual subjects are birds and their environment – not close-up flowers! Anyway I can say that I have learnt a lot in a couple of days. Then, I could not identify what I had seen so I took out a friend with a lot more experience in identifying wallum plants than me. 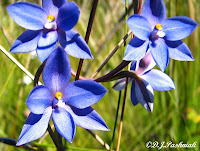 The first flower is a Slender Sun Orchid (Thelymitra pauciflora) and apparently quite rare for around here. It is growing down in a damp swampy area of the wallum. The other flower was up on a ridge growing on a rocky piece of ground where hardly anything else was growing. 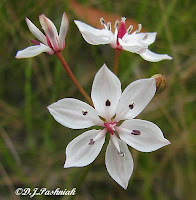 My friend had never seen this flower before, although we eventually found it described in a book about the vegetation of the Noosa area. 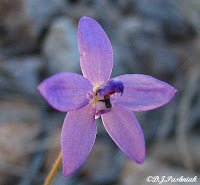 It is a Small Waxlip Orchid (Glossodia minor). Please feel free to correct any mistakes I have made in ID of plants. 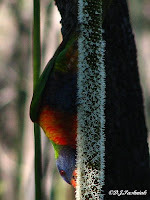 The first afternoon I was walking through the bush I could hear lots of Rainbow Lorikeets and Noisy Friarbirds. This usually means there is a good honey source but it took me a while to discover that they were apparently getting nectar from the flower stems of the Xanthorrhoea. There are both species of Xanthorrhoea – fulva and johnsonii - in close proximity in this area. 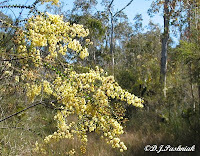 There was one patch of bush where every flower stalk had a bird swinging on the stems and busily getting nectar. 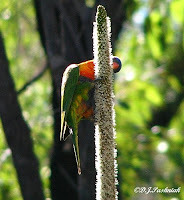 Rainbow Lorikeets up, around, and down on the flower stalks of Xanthorrhoea.